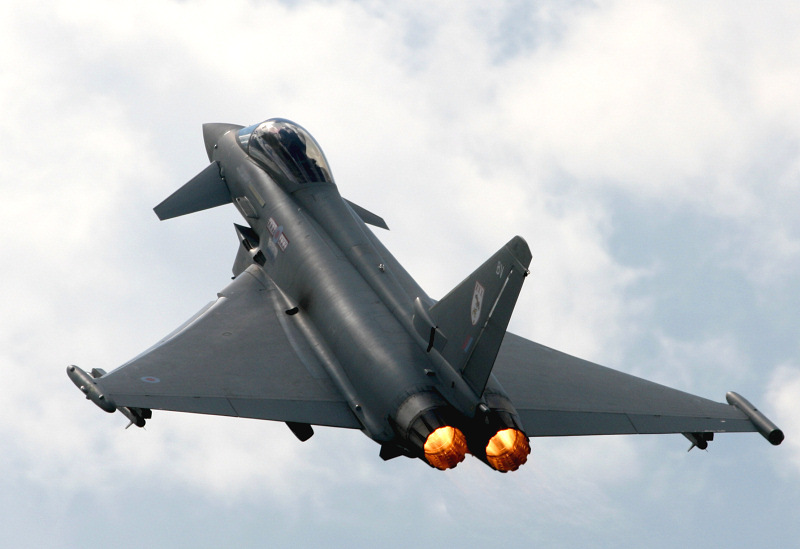 Typhoon is bound for resort airshow - Rhyl Airshow - Military Airshows News & Press Releases. Organisers of this year's Rhyl Air Show are delighted to announce that the RAF Eurofighter Typhoon display team will be making their debut appearance at the air extravaganza, taking place on 24th and 25th of August. The line -up also includes Team Raven - a formation aerobatic display team flying 5 Van's RV8 aircraft from Wales, high energy aerobatics from Steve Carver and The Royal Logistic Corps Silver Stars Army Parachute Display Team. Councillor Hugh Evans OBE, Leader of Denbighshire, said: "The Rhyl Air Show is recognised as one of the best events of its kind in the country and there is always great anticipation to see what will be appearing. We have a great line-up in place and this year's event promises another fabulous attraction for the thousands of residents and visitors expected on the promenade. "Visitors to the promenade will also be able to see at first hand the investment that has gone on, including the completion of building SC2, the flagship waterpark and TAGactive attraction; the 1891 restaurant and refurbished Pavilion Theatre; two brand new hotels, a bar and carvery, as well as the refurbishment of the Central car park (formerly the underground car park). Rhyl mayor Councillor Win Mullen-James said: "The Air Show is a spectacular event that ends the summer season on a real high. Year on year, the Air Show secures displays from some of the leading aviation display teams and historic aircrafts and we have received great feedback from visitors and residents who return time and again for the event. "The town will be buzzing with excitement and we hope that people attending the Show will take the opportunity to visit the town centre and see for themselves the wealth of shops, restaurants, cafes and bars we have in Rhyl. "This event certainly puts the town on the map, it's great for its reputation and a super opportunity to boost the local economy." Flight Director, Peter Sinclair, said: "Bringing the RAF Typhoon to this year's Rhyl Air Show was a coup for the Council's Events Team. Major changes in the UK Display Calendar for 2019, caused by the Red Arrows tour of North America, meant that the Rhyl Team were able to move quickly to exploit an opportunity and bring this extraordinary aircraft to the Event for the first time. This is a huge step up for Rhyl. "The RAF's Lancaster was built at Hawarden and for the RAF to allocate BBMF, including its iconic bomber, means that we can put on another very worthy show with a good military presence. The RAF Tucano will also be at Rhyl for the first time in many years and the Events Teams is still in discussions with other potential participants. There will be other high profile display items that will ensure that this 11th Rhyl Air Display of the modern era showcases the development and style that is becoming Rhyl"